Here's the auditorium before there were people inside - it didn't look too frightening at first, but I was still as nervous as ever. My mom and her friend Rinda were so great to take pictures for me. 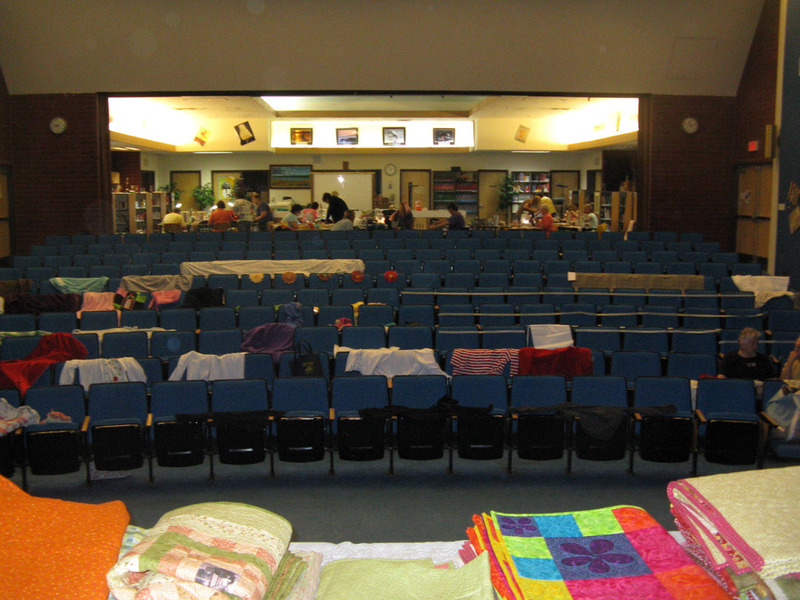 By the time this was all filled up, with chairs being brought in for the back section, Clint figured there were over 300 people. Pretty good turn out for my first trunk show. There I am in the doorway - just waiting to do my thing. I kept thinking " I should probably go to the bathroom," but then I kept talking myself out of it. So, when my name came up - I really had to go, but had to put that feeling on the back burner and get through the trunk show. Hideous picture of me - the only reason I am showing it is because I had a cordless microphone, but I kept turning it off accidentally. So embarrassing! They had to drag in a microphone with a cord so I would stop doing that. It made for some good lame jokes and lightened the mood a little bit. My mom started crying right at first - then I did - what am I going to do with her? 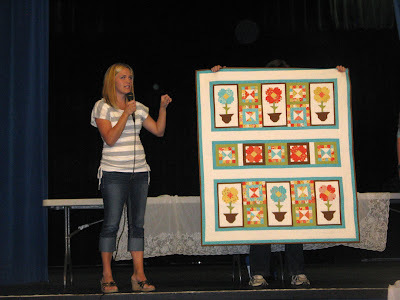 Here's me talking about my "Flower Patch" quilt - easily a favorite quilt of mine, it's just beautiful and I never get sick of looking at it. I totally talk with my hands - always have and always will. Here, I am showing off "Dahlia." 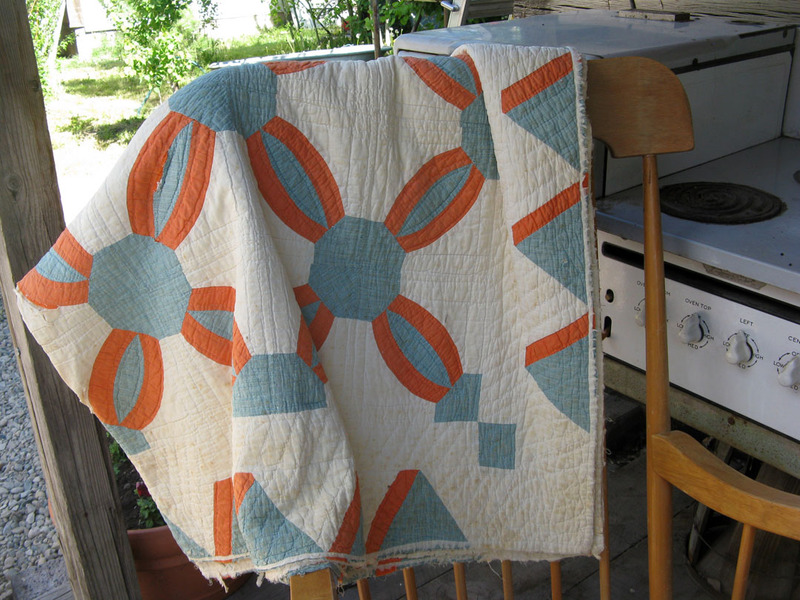 It's funny how many people think that this quilt has applique in it, but it's all piecing and I absolutely love it! Joe and Nan brought their "Blue and White" quilt - I don't have the name for it, but Nan says she will let me know what the pattern is when she finds it. 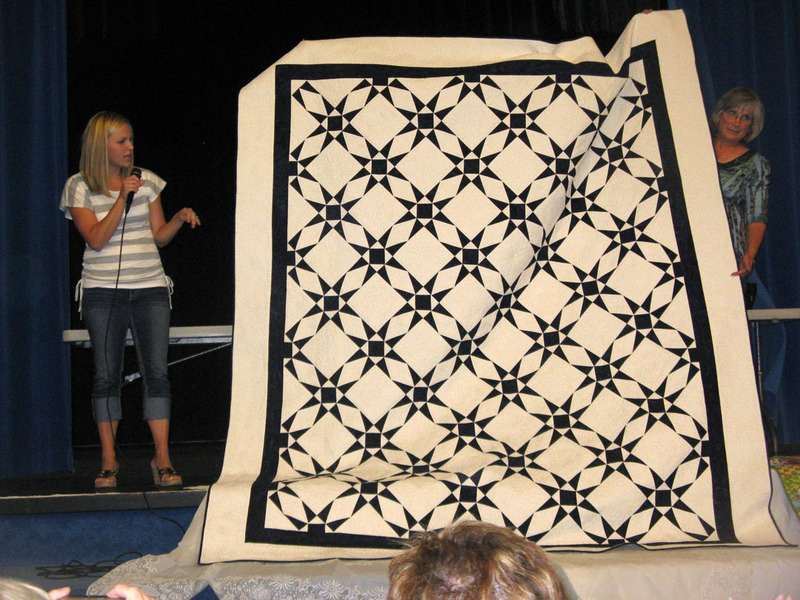 It was probably hard for everyone to see the detail quilting of this quilt, but you can check it out for yourself here. There's Joe and Nan - easily the nicest people in the world! I just love them! 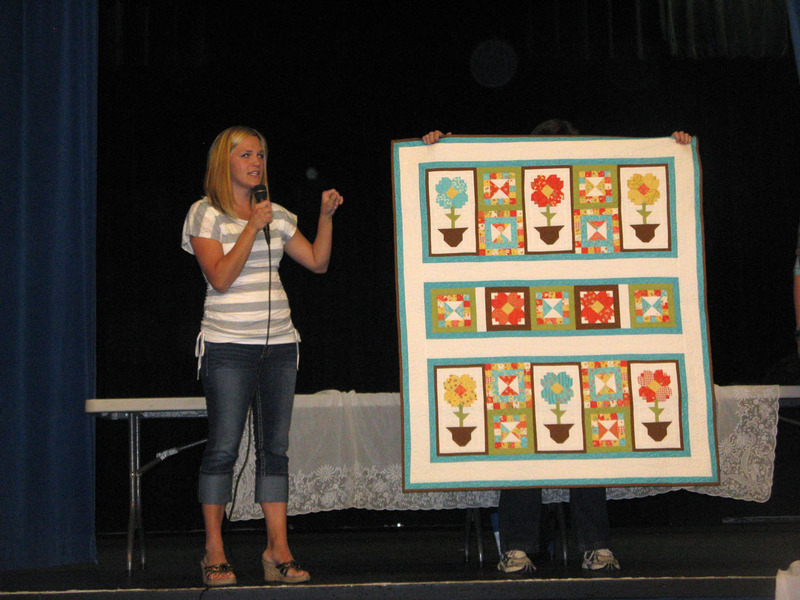 Here I am talking about "Serenity," the gasp in the audience is always a good sign that they loved the quilt. Afterward I sold some of my patterns and I was able to meet a lot of the people there. It was so fun being able to meet so many sweet and wonderful people! I think Panquitch is a wonderful little town and I had such a good time. Claudia is the best! 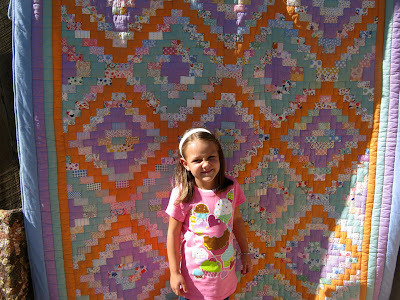 She is in charge of the Quilt Walk and she did a beautiful job. I am so lucky that I know her, she is so amazing! After the Trunk Show I walked around with my mom, daughter and my mom's friend. We were able to see houses that had wonderful quilts in each room. I did have to take a picture of this saying - now I just have to convince Clint that this saying should be my Motto! This was at Claudia's house. She has a ton of antiques and it was so fun just walking around her place. I took this picture, just imagining how perfect it would be for a backdrop for one of my quilts. I loved this quilt, it looks totally modern to me. It was just beautiful and all done by hand. Another beauty - I am assuming that Claudia made this quilt, but she can let me know different if that is the case. Lili had a lot of fun walking around with us. 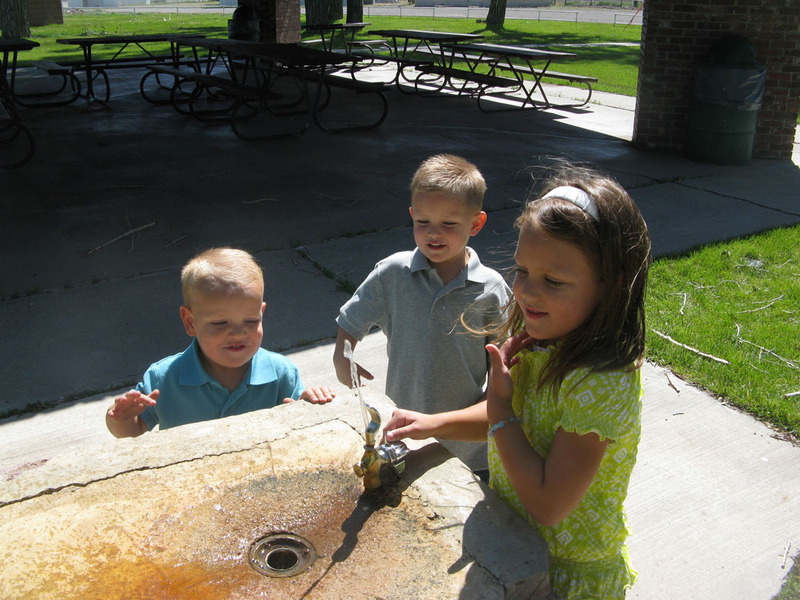 We had a wonderful time in Panguitch! I love the feel of a small town, where everyone knows everyone else and life just seems so much more simple. Clint and I were ready to pack up and move there, then we remembered that our life won't get any simpler just yet. We still have all our responsibilities of the business, and it keeps us super busy. It was fun to take a time out and really let the kids just play. Lucky for us, there was a park right behind our Motel. 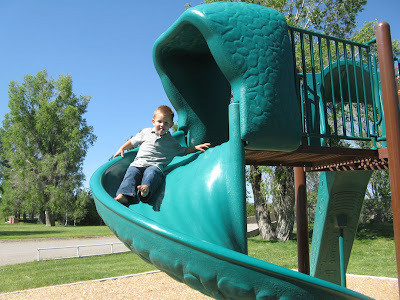 The kids thought that was the best - what I loved about the park was that there weren't any other people there - we had it all to ourselves. So the kids could just be free and have a wonderful time. I can't ever get a serious picture of this kid - he makes me laugh though. He had so much fun. The drinking fountain proved to be a favorite. It shot up about 10 feet and the kids thought that was the best. 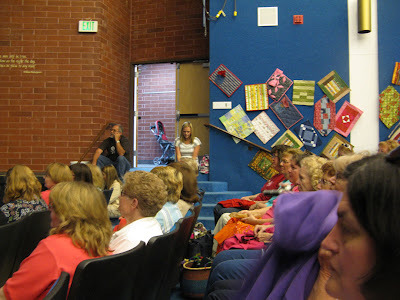 Thanks Panguitch for a wonderful time! We will be back for sure! 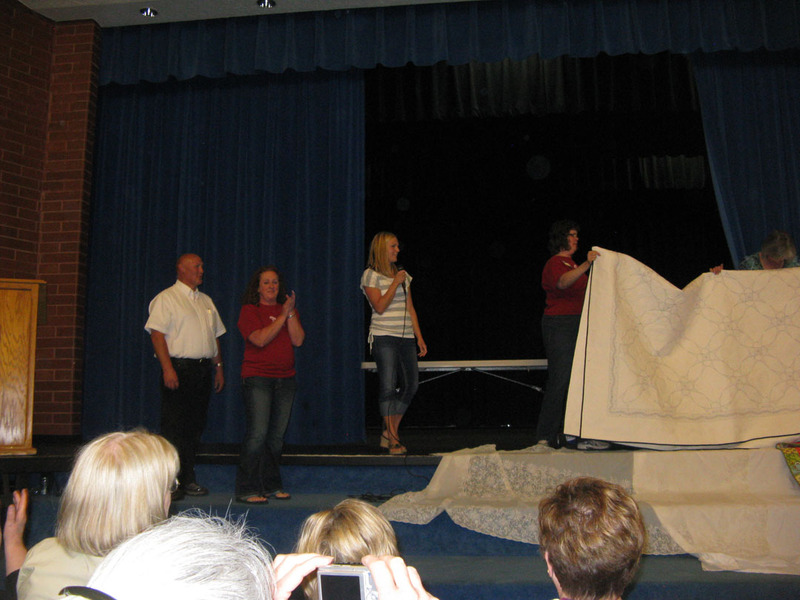 Congratulations on a successful trunk show. 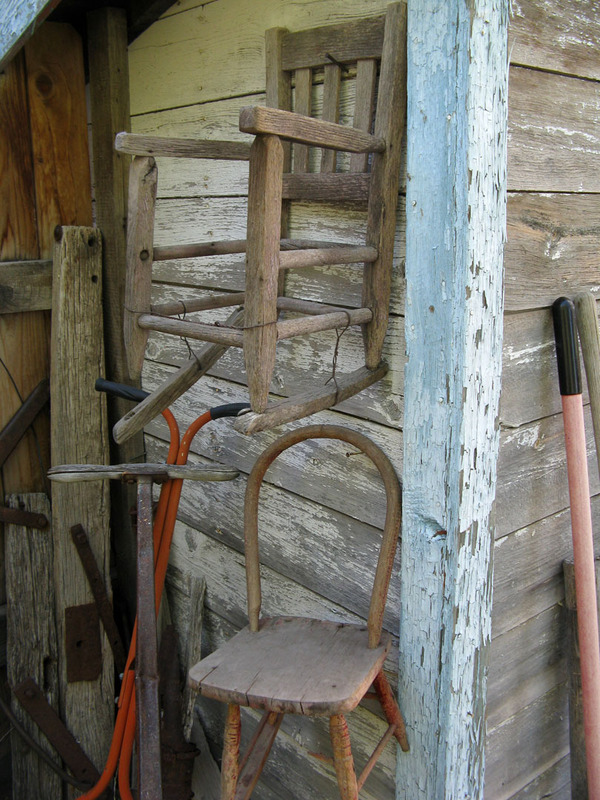 Funny, the photo with the chair hung on the wall reminded me of my son's log cabin - same kind of chair on the wall - where he has one of my quilts and a pencil sketch his granddad did for him. Great that your family could join you on your venture. Seems like you had a great time and even survived talking in front of all those people! Good for you! It must be so satisfying showing off your handiwork to a room full of people who are all interested in what you have to say. 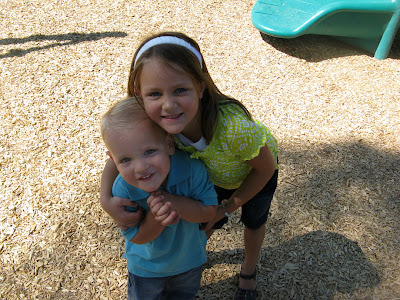 Your kids are just darling! There we go - i knew you would do well and they would all love you. Well done - one of many I am sure. So delightful to have been able to share the trunk show with you as I giggled at your dry sense of humor, shed some tears of support and to see you up there being CELEBRATED by the crowd. WAHOO!!!!!! congratulations!!! Soon you'll be doing these all the time... your skills are just beginning to be appreciated! I love small towns and it looks like this one embraced you in full force. Glad it was a good time for all. 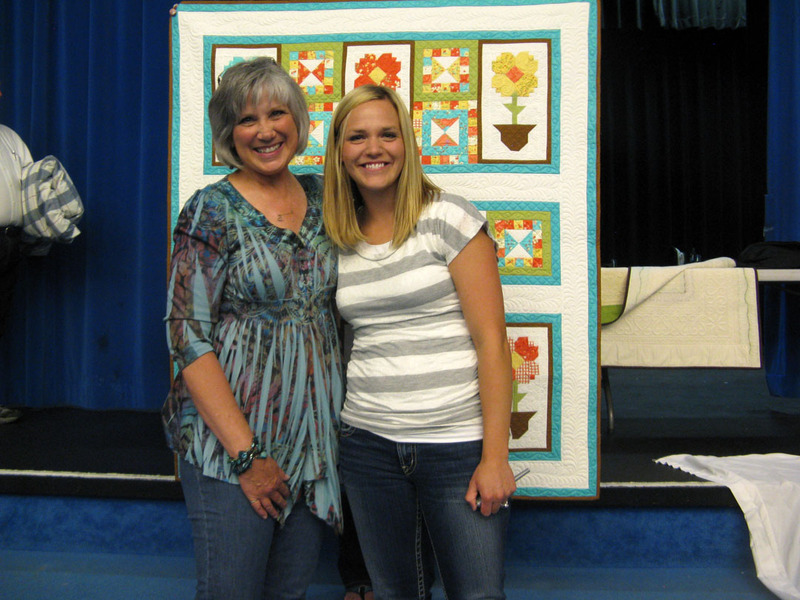 Loved seeing your quilts. Can I quote that motto! I so agree with it. 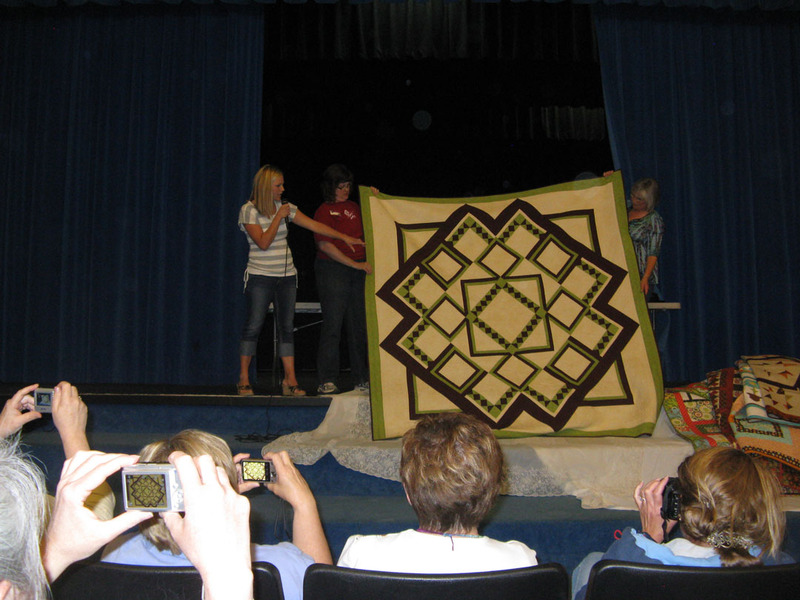 Great show...great quilts! 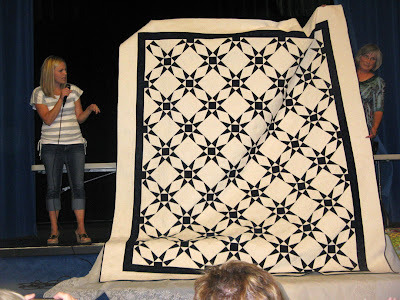 I just ordered "Dalia" after seeing that it was pieced, not appliqued. Keep up the great work! 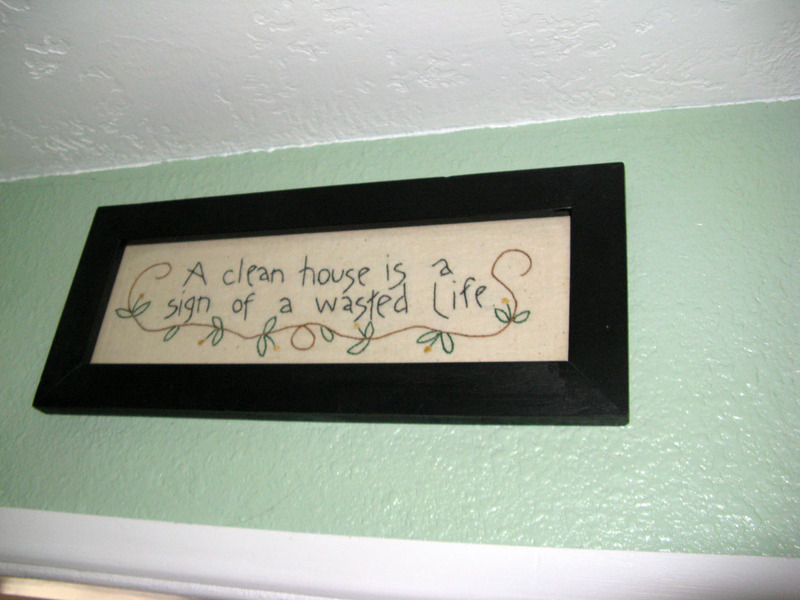 That motto is totally me!!! And my husband would agree (that it's me) and wonderfully loves me enough that it doesn't bother him anymore!! Looks like you had a great time at the show and you did an awesome job!! Thank you for sharing. I would have LOVED to have been there. A little far from Florida, though! I'm so glad everything went well for you in Panquitch, and that you loved the friendliness and small town atmosphere. And it's so fun to see your picture with Claudia. She is one of the nicest ladies I've ever known. I am feeling so blue that I missed your trunk show. I heard that it was fabulous. Way to go. Wonderful job at the trunk show! 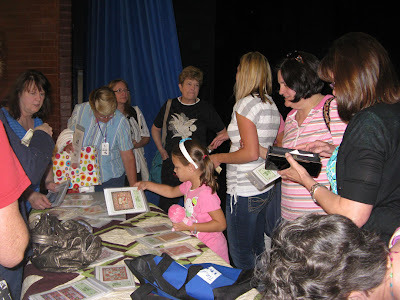 Over 300 came to see you ... you truly deserve every accollade ... beautiful work!! Yay you!! Thank you so much for sharing and thanks to those who took the pictures too! Judi, I'm so happy for you, Em told me the show was wonderful. I would have loved to have been there, to see your work in person. So glad you all had fun. thank you! you inspired me on something more!!! OMG! You are SO lucky to have things like this where you live. 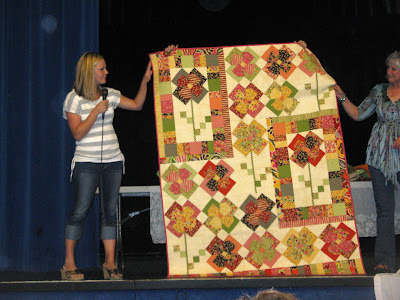 I've only recently taken up patchwork and quilting here in the UK, and have found it quite hard to find many other people, groups or even stores that are really into it. However, after several months I've now found one or two stores that are REALLY good, and even my local sewing shop is starting to do more quilting fabrics, so things are looking up. I'm about to become a follower as I only found your blog today and am SO impressed with your work. HI Judi (& Clint), Melissa from Happy Quilting was coming but her kids became ill. She thoughtfully put up this link to your trunk show. May I say unbelievable, fantastic quilting you deserve every second spent on this so don;t let that impish devil give you a hard time. It is a joy to see your quilts then looking back on the patterns/quilting on your site. 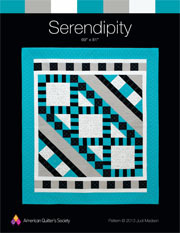 So I am lookng forward, thinking what jr & lc for the first quilt. Just love it. Glad I saw this other side/s of you not just a retailer but creator.